The High-Energy-Density Physics Division, headed by Dr. Richard Petrasso, studies the physics of inertial-confinement fusion (ICF) plasmas and high-energy-density plasmas using experimental and theoretical methods developed by MIT and collaborators. ICF experiments utilizing special nuclear diagnostics are currently performed at the OMEGA laser facility at the University of Rochester Laboratory for Laser Energetics and at the National Ignition Facility at the Lawrence Livermore National Laboratory. Special nuclear diagnostics make it possible to determine the spatial and temporal variations in fusion burn and in plasma areal densities through spectral, temporal, and imaging measurements of fusion products and other ions. These measurements are then used to study a wide variety of physics processes and issues such as laser-plasma interactions, the relationship of implosion symmetry to laser drive symmetry, the timing of shock wave coalescence, the effects of mix on convergence and burn profiles, the effects of hydrodynamic instabilities, and the accuracy of hydrodynamic simulations. In addition, experiments are being designed for studying the transport of energetic electrons in materials relevant for “Fast Ignitor” ICF scenarios. Theoretical work has involved studies of the slowing down of charged particles in plasmas and the transport of energetic electrons in solids and plasmas. The focus of the work is developing novel diagnostics, furthering the understanding of ICF physics, and pursuing ignition. Another important goal is the education and training of young scientists and students. HEDP Principal Research Scientist Johan Frenje chaired this meeting in Rochester NY 27-28 September 2017. Frenje has stated, "The overarching goal with the NISP effort is to substantially advance our understanding of the physics of the stagnation process and state of the fuel and ablator near and at stagnation through improved analysis and simulation as well as new experiments and diagnostics." Updates made to the FY16 hypotheses for the discrepancies between observations and stagnation models. Assumptions/limitations/uncertainties in the stagnation models. New stagnation/burn diagnostics coming on-line in support of upcoming experiments. Hydro-scaling arguments, assumptions and limitations. Feedback from ICF red-team review and 2020 goals, pertinent to the NISP working group. To learn more about NISP. Most of our PhD students have done important thesis research at the OMEGA Laser Facility, but on April 15, 2015, Alex Zylstra became the 4th student to earn his PhD with research that also included work on the NIF. MIT is the only university that has a collaboration of its graduate students with the NIF. The four former MIT students who did important work both at the NIF and at OMEGA as their thesis research are, from left to right, Dr. Hans Rinderknecht, Dr. Dan Casey, Dr. Alex Zylstra, and Dr. Mike Rosenberg. They are shown standing next to the MIT designed neutron spectrometer at the NIF, for which Dr. Casey was a principal designer. Some recent work By Dr. Zylstra and Dr. Rosenberg is shown below. 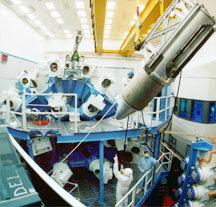 Compact proton spectrometers (upper left) were used to assess implosion symmetry in ignition-scale, indirect-drive implosions for the first time. Implosions of D3He-gas-filled capsules at the National Ignition Facility produced energetic protons via D-3He fusion, and those protons were used to measure the capsule's areal density (ρR) at the shock-bang time. The energies of the protons, which are born at 14.7 MeV, are often different when measured in different directions from the fuel capsule; the energy they lost while leaving the capsule in each direction allows us to calculate the ρR of the compressed capsule in that direction [A. Zylstra et al., Physics of Plasmas 22, 056301 (2015)]. Four Massachusettes Institute of Technology (MIT) PhD students played an important role in the highly successful implosion at the National Ignition Facility (NIF) on March 12, 2013, in which a record deuterium-deuterium (D-D) fusion yield (5x1012) was achieved. The four students, Hans Rinderknecht, Mike Rosenberg, Alex Zylstra, and Hong Sio, all from the MIT Physics Department and the MIT Plasma Science and Fusion Center, were part of the team responsible for fielding nuclear spectrometers that revealed critical internal plasma conditions of the implosion. For this deuterium-fueled implosion, the D-D fusion reaction has the following two equally probable branches. By carefully analyzing the spectra of both the energetic protons and neutrons from these latter reactions, and doing such in a novel and integrated fashion, the MIT PhD students were able to infer the D fuel areal density (15 mg/cm2) and electron temperature (1.8 keV), and the total (fuel and shell) areal density (45 mg/cm2). 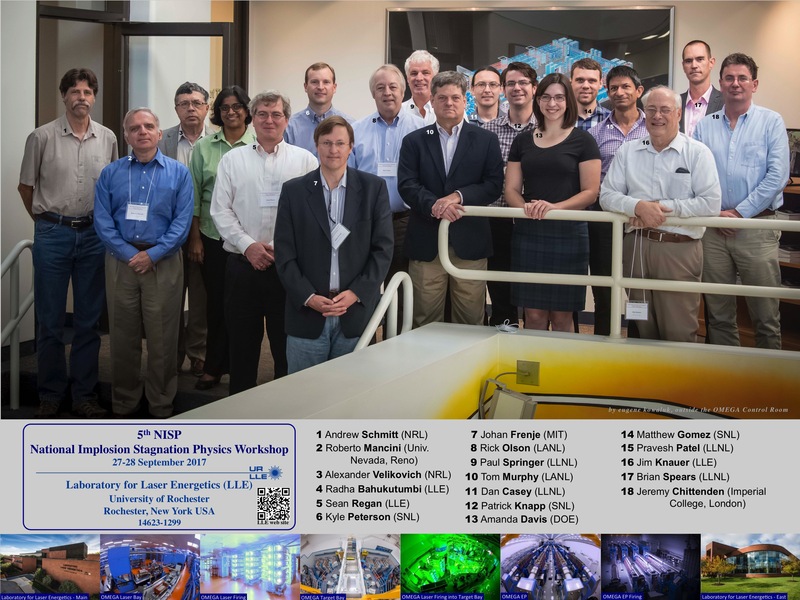 Members of the MIT-NIF team responsible for the development, testing, and calibration of the wedge range filter (WRF) proton spectrometers. PhD student Mike Rosenberg, an active participant in NIF experiments, holds a tray of the spectrometers next to the accelerator used in their final calibration. The joint press release heralds the recent paper published in the Physical Review Letters by group members Johan Frenje, C.K. 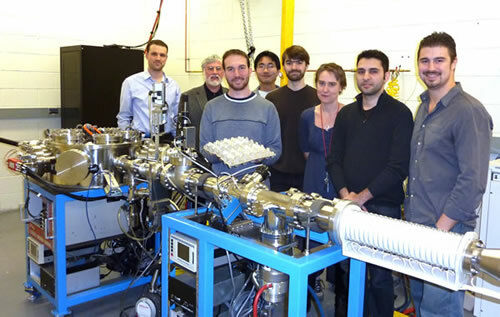 Li, Fredrick Séquin, Dan Casey, and Richard Petrasso and their collaborators at LLE and LLNL. The paper "Measurements of the Differential Cross Sections for the Elastic n-3H and n-2H Scattering at 14.1 MeV by Using an Inertial Confinement Fusion Facility", represents the first fundamental nuclear physics result obtained from a high-energy-density facility. "With this class of experiments imminent, a new and exciting field of research is ushered in: plasma nuclear science, blending the disciplines of plasma and nuclear physics," said lead researcher Johan Frenje of MIT. Congratulations to Johan Frenje, Hans Rinderknecht, Alex Zylstra and team members for receiving NIF Directorate Performance Awards. Three members in the MIT-HEDP division received the National Ignition Facility and Photon Science Award for their outstanding contributions in designing and implementing diagnostics that have been essential to the progress of the National Ignition Campaign (NIC). "Dr. Johan Frenje received the award for outstanding contributions in designing and implementing large scope, advanced neutron spectrometer in support of characterizing NIC implosions". PhD student "Hans Rinderknecht received the award for outstanding contributions in designing and implementing particle time-of-flight detector in support of characterizing NIC implosions. ", and PhD student "Alex Zylstra received the award for outstanding contributions in designing and implementing proton spectrometer in support of characterizing NIC implosions". New Paper by Chikang Li et al. in Science! (A) Schematic of the experimental setup, with proton backlighter, hohlraum-driven implosion, CR-39 imaging detector, and laser drive beams. Fifteen laser beams entered each end of the hohlraum: 5 with incident angle 42° and 10 with angle 58.8°. The colors shown on the hohlraum wall indicate the laser intensity distribution [modeled by VISRAD]. The proton backlighter was driven by 30 laser beams with total laser energy ~ 11 kJ in a 1-ns square pulse. The 15 MeV D3He backlighting protons passed through the laser-driven hohlraum, sampling plasma conditions and capsule implosions at different times. Images in (B) show proton fluence (within each image, darker means higher fluence), while images in (C) show proton energy (within each image, darker means more proton energy loss and therefore more matter traversed). The gray-scale mapping for image display is different in each image. The capsule mounting stalk appears in the upper left corner of each image. Click the image to see the Science paper. electric fields generated by the other implosion. On the right is the resulting image of the fields, with the compressed hydrogen pellet in the center. Click the image to see the Science paper. on shot day (13 March 2008) for the MIT NLUF experiments at the OMEGA laser facility.